Used instead of traditional potato, the mashed pumpkin gives the finished gnocchi a beautiful golden colour and sweet taste. 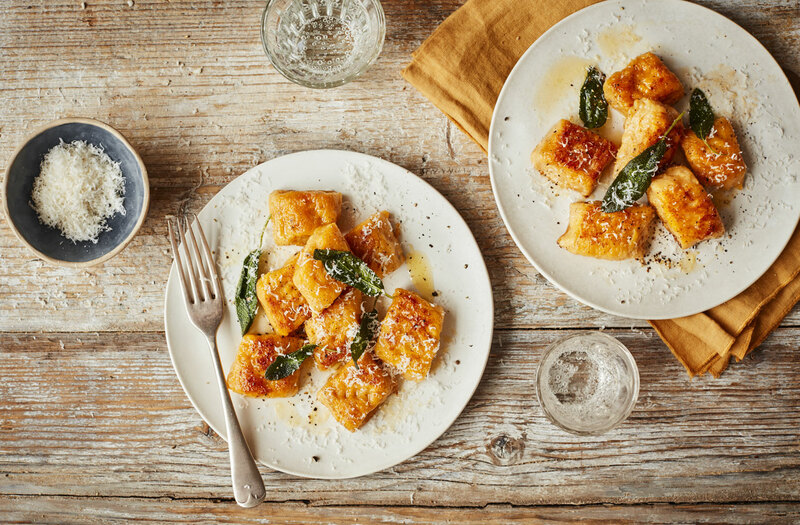 Cooked with a simple sage butter sauce, this recipe is sure to warm you up on chilly autumnal evenings. If pumpkins are not available, butternut squash works just as well. To make this recipe vegetarian, swap the Parmesan for vegetarian hard cheese. Steam the pumpkin in a colander set over a pan of simmering water or a steamer pan for 20 mins, or until very soft and tender. Using a potato masher, mash the steamed pumpkin to a smooth purée. Line a surface with kitchen paper and spread the pumpkin purée over before patting dry to ensure you remove as much moisture as possible. In a bowl or food processor, mix the pumpkin purée, ricotta, grated Parmesan, the egg, ¼ tsp salt and some black pepper. Stir well to combine, then add the flour and use a wooden spoon to mix to a soft dough, taking care not to ‘overmix’. Turn out the dough onto a floured surface and cut into 4. Roll each piece into a 1.5cm wide log. Cut the log into 2cm pieces using a floured knife. Gently mark each gnocchi with the back of a floured fork to achieve the traditional ridges. Bring a large pan of salted water to the boil. Tip in half the gnocchi and cook for 1-2 mins, until they rise to the surface. Remove with a slotted spoon and cook the remaining gnocchi. Heat 15g butter and the oil in a large frying pan. Add half the gnocchi and fry for 2 mins or until starting to brown. Add 15g more butter and, once melted, add the sage leaves. Fry for 1-2 mins, until the gnocchi are golden all over and the sage is crispy. Repeat with the remaining butter, gnocchi and sage leaves. Divide between serving plates. Season with a twist of black pepper and some shavings of Parmesan. Tip: If the dough is too sticky to handle when rolling, add a little more flour, trying to add as little as possible. Uncooked gnocchi will keep for up to 2 days in the fridge if dusted in flour to prevent them sticking.